Having been born and raised in Southern California, I found myself always wishing I were from elsewhere. “Elsewhere” — the concept was perhaps only a figment of my green imagination, but it often stemmed from thoughts I couldn’t help thinking. I was tired of the desert climate, the San Andreas Fault’s constant reminder of “warning: earthquake territory,” the searing lick of the Santa Anas as the only indication of summer turning to fall. I wanted the four seasons; I wished I were from Boston. I was bothered by the “Valley accent,” unnecessary oscillations shoved into monosyllabic locutions such as “yes” and “no” and “babe” and “dope” — words somehow dropping at least two octaves by the time they were fully enunciated. I wished I were from London and sounded cool like Mick Jagger, chic like Kate Moss. … it has only been in the recent years, as I’ve “come of age,” as they say, that I’ve opened my eyes to see the kaleidoscope vision that is California. And I was truly dispirited walking down streets where people smiled for the ego, took action for image’s sake, felt good living a sham style — a middle-class prelude and a blue collar crescendo, all drowned out by the screech of pseudo-wealth and “all things designer.” I wished I were from the blue Copacabana beach, where I could put my worried mind to rest and live for rides on sailboats. Because there, I wouldn’t have any troubles, and even if I did, I wouldn’t know it because they’d be outshined by glimmering rays of light reflecting off the glassy water — out of sight, out of mind. But now, with my teenage angst-fueled days of ambivalence far behind me, I have found that my longing to come from “elsewhere” is gone — completely vanished, dried up as rapidly as torrential desert raindrops evaporate off the slabs of red clay rocks or white suburban window panes. I have found that instead, I feel connected to California in the sort of way one is connected to their name: an identity, something personal, something that never leaves you. And it has only been in the recent years, as I’ve “come of age,” as they say, that I’ve opened my eyes to see the kaleidoscope vision that is California. Home is Westlake Village — cradled by the Santa Monica Mountains, flanked by the Mojave Desert, Death Valley and, least appealing of all, Bakersfield but made legendary by being a part of “the Los Angeles area.” The pendular journey of “coming of age” in the land of starlets and rock-’n’-rollers can perhaps be best described as an “artistic experience” that no doubt takes some figuring out before you can make your peace with it. It’s a confusing place, Los Angeles, compounded by a confusing age and further distorted by a confusing time in history. And when you’re growing up “20 minutes north of 40 minutes outside LA,” or something ridiculous (though colloquial) like that, the desire to come into your own and “make it” is so strong you can taste it, just like you can taste the relentless heat coming up off the pavement in the back of your throat. By the time I had “come of age,” I knew that the center of that world would always be California — the beloved motherland of all free spirits and people who have learned how to see “cool” too. As a kid growing up in the vicinity of Los Angeles, I felt irrevocably connected to the artists who shared the very same space. These artists painted the picture of how I conceptualized “cool,” but more importantly, they painted the picture of how I could visualize myself in the world. After all, isn’t being “cool” all about possessing an unwavering confidence in one’s own identity, rather than subscribing to a generic template? By the time I had “come of age,” I knew that the center of that world would always be California — the beloved motherland of all free spirits and people who have learned how to see “cool” too. The Beats of San Francisco, the technology junkies of Silicon Valley, the glam-couture kids of the Hollywood Hills: all passionate, all innovators of their own design. It is this identity that I constantly envision when I think of the beauty of my home. But the people aren’t the only mesmerizing thing about California — the state is certainly one of the most beautiful places you can be in the whole country, probably even the world. Like staring into that California kaleidoscope, every time I turn my head, I see new intricate patterns of colors falling from the top of the world, down, down until they coagulate together in the shapes of golden suns, green trees, blue seas and skies. My head becomes a movie theatre when I shut my eyes, dim the lights. I play reels of childhood memories: turning 16, learning to drive, friends piled in the car. Route of choice: Kanan Canyon, the “long way” home from Malibu to Westlake, so we can stare at the waves a little bit longer, sit with sand still clinging to our wet ankles for a few moments more and listen to Joe Cocker or Deep Purple just as long as we please. It’s times like these — fragments of my own coming-of-age story — that made me fall madly in love with California: a place I’ve only truly come to appreciate as I’ve grown older. 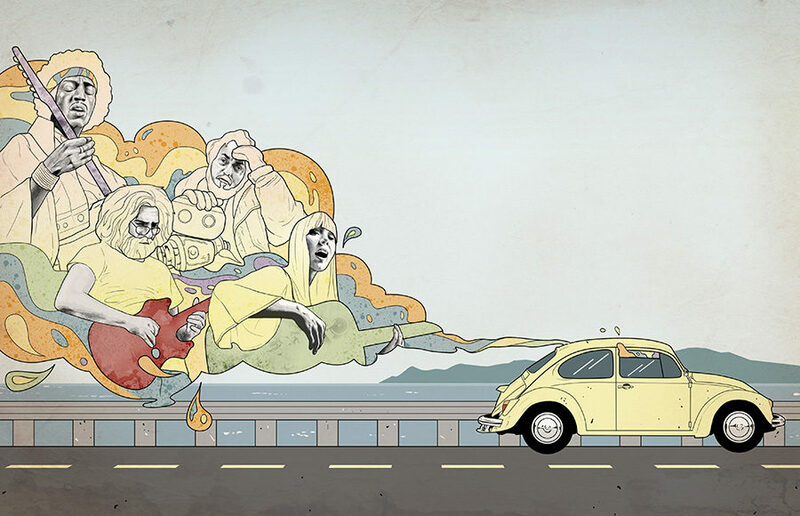 Throughout the sweet years from 16 to 18, I blasted groovy tunes out of the Fender speakers of my Volkswagen Beetle. I still hear the lyrics of my favorite songs playing over the roar of the open windows, and I see that they ring true: Led Zeppelin’s “Going to California” or Mitchell’s “California, I’m comin home” or Scott McKenzie’s “If you’re going to San Francisco …” Through ballads, they express the untamable and radical pull that comes from the West; it calls to some people with the strength of gravity and the constancy of the California climate. I worshipped the movies that seemed to capture the intangible quality of Southern California that, despite growing up there, I still struggle to put my finger on. I watched ­double features with buddies piled together on the purple carpet of my living room. I found myself drawn into the mystique that came out of the old Hollywood Hills, as the actors, soundtracks and innovative directorship said it all. Regardless of genre, films such as “Pulp Fiction,” “Chinatown” and “The Big Lebowski” managed to illustrate visually what cannot be put into words about the iconic wasteland-turned-oasis that is Southern California. If the emphatic body of pop culture and art doesn’t capture the kaleidoscope identity of California for you, then hop in your car, turn left onto the Pacific Coast Highway (avoid Interstate 5 with all your might, or be subjected to the truckers and meth labs of California’s central basin) and take it all in. Experience the local spirit — American Spirits, that is — of Malibu. Bleach-colored, no, honey-colored hues all around. Surfboards kicked up against every wall, local knowledge written in the sand. Hedonists, but who can blame them. The people of Malibu live in the winds, the trades and the easterlies, a constant flow, necessary for the surf and the soul. Or see the low-key kind of cool in Santa Cruz. On my trip into this beach town, home of the Banana Slugs, I met hesh babies there who held their cigarettes with tattooed hands, smoke swirling in tendrils as blue as the sea crashed against the cliffs outside. I stayed in their beach cottage, and after a time, we all left together: me, the girl with silver moonshine hair, the drug-addled New Yorker-turned-hippie and others — but no one thought to pick the hash pipe off the floor before we hit the road. California, the canvas of creation, the social experiment, the gilded future, the promise land, the golden home. California, a collection of the fragments of pop culture that came straight out of it: “Midnight Sun,” “Grapefruit Moon,” “The Velvet Underground” (not the band, the book associated with freedom), “Drunk and with Dreams,” “Tangled Up in Blue,” “Stairway to Heaven.” California, the cri de coeur of all artists and innovators, the rhapsody of forging dissident visions. The kaleidoscope is in my backyard, and I wouldn’t want to be anywhere else.